Are you a weather watcher? Do you check the skies often when storms are approaching? Are you fascinated by the science of weather? Would you like to perform a public service? Then you might be a candidate to become a SKYWARN® weather spotter! The National Weather Service (NWS) Pittsburgh office in conjunction with the Punxsutawney Weather Discovery Center is presenting free training on how to become a volunteer weather spotter on Thursday, April 18 at 6:30 p.m. at the Weather Discovery Center facility at 201 N. Findley St. in Punxsutawney. The course generally runs for 2 hours. A Warning Coordination Meteorologist from the NWS Pittsburgh office will present the SKYWARN® training and will cover the basics of thunderstorm development, the fundamentals of storm structure, identifying potential severe weather features, what information to report and how to report it, and basic severe weather safety. Even if you don’t want to report to the NWS, this is good information to know. Fred McMullen, warning coordination meteorologist with the Pittsburgh NWS says that storm spotters are part of the first line of defense against severe weather. “Spotters can give their communities the precious gift of time when a storm is approaching. Seconds and minutes can save lives,” says McMullen. The NWS encourages anyone with an interest in public service and access to communications, such as HAM radio, to join the SKYWARN® program. The ranks of volunteer storm spotters include police, fire personnel, dispatchers, EMS workers and concerned citizens. Individuals affiliated with hospitals, schools, churches, nursing homes or who have a responsibility for protecting others are also encouraged to become a spotter. Since the program began in the 1970s, the information provided by SKYWARN® spotters, coupled with Doppler radar technology, improved satellite and other data, has enable NWS to issue more timely and accurate warnings for tornadoes, severe thunderstorms, and flash floods. 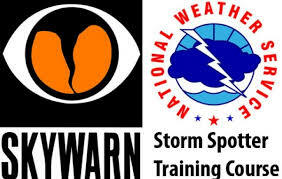 To register for the free SKYWARN® weather spotter class, visit call 938-1000 or e-mail info@weatherdiscovery.org. Walk ins will also be welcome on the night of the program, as long as space is available.